What isn't there to like about flying a helicopter or going for a helicopter flight? It's certainly fun and gets the adrenalin pumping! Taking a helicopter flight is one of the most exciting adventures you'll ever do. Whether you are interested in a helicopter charter, a helicopter ride or learning to fly a helicopter, the experience of soaring through the air and seeing the landscape below is very exciting. Don't miss your opportunity to take helicopter flights in Sydney, Adelaide, Darwin, Perth, Hobart, Melbourne, Brisbane and Canberra. So get ready to put your headphones and pilot's cap on. A helicopter joy flight is something you'll never forget. Join us on this 2 day adventure, and walk among the Bee Hive domes of the magnificent Bungle Bungles. Overnight camp in this World Heritage listed area, trek Echidna Chasm and Mini Palms (time permitting). This tour is designed for the active traveller with limited time ... jump on board! Under the guidance of one of our team members, you will have the opportunity to take control and fly. With various scenarios available, you can fly around and land on an oil rig, a ship or at Jandakot Airport. Perfect for anyone who loves the thrill of flight! Take a real adventure! Stay in the Kings Canyon Resort and experience one of Australia's most remote tourist destinations. Discover the real Australian wilderness, contemplate 'The Lost City' and take the amazing Rim Walk. Explore the real, awe-inspiring Australia - then head back to your oasis! Stay in Kings Canyon and experience the real outback! All meals are included over these wonderful three nights and days, so you can explore the entire region by day and relax with no worries at all under the sparkling southern sky. Australia's red centre beckons you to the adventure of a lifetime! Exciting from lift off to touchdown! Take to the sky in one of our bubble-cabined Bell 47 helicopters offering unrestricted 180 degree panoramic views. 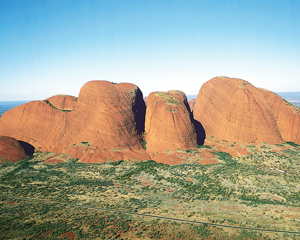 You'll have spectacular views of the Red Centre from the best seats in Australia! Don't forget your camera! 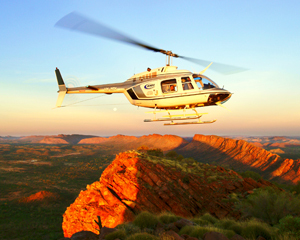 This is a fantastic opportunity to explore world heritage listed areas of the Northern Territory by helicopter. Discover the heart of the Outback with this amazing flight. Ayers Rock is the world's largest monolith and an Aboriginal sacred site. 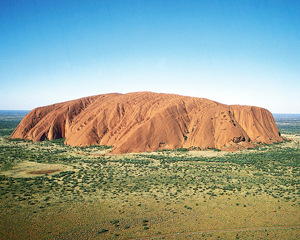 It is Australia's most famous natural landmark and this is an exceptional opportunity to take it all in - in a helicopter! Ayers Rock is the world's largest monolith and an Aboriginal sacred site. It is Australia's most famous natural landmark and this is an exceptional opportunity to take in the enormity and true majesty of the rock - in a helicopter. The Bungle Bungle Range, in the Purnululu National Park, is one of the most fascinating geological landmarks in Western Australia. Spend a day exploring by plane,4WD, guided tour and helicopter! 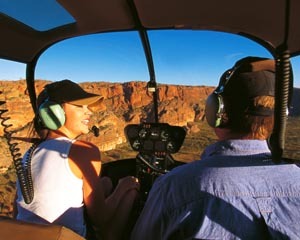 This award winning 48 minute helicopter flight is a spectacular way to see Bungle Bungle from within the National Park. 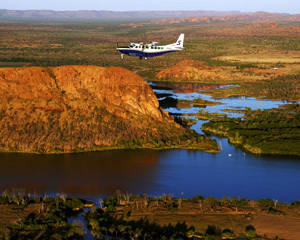 This award winning 30 minute helicopter flight is a spectacular way to see Bungle Bungle from within the National Park. 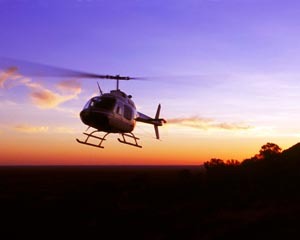 This is an amazing opportunity to experience the awe inspiring colours and tones of an outback sunset from a helicopter! Take a helicopter flight over four reef locations before boarding Osprey V at North Hastings Reef. Here you'll enjoy a range of underwater activities. Complete the afternoon with a leisurely water cruise back to Cairns with live entertainment, a complimentary glass of wine and nibbles. Spend the day cruising around two reef destinations. A BBQ lunch and underwater activities such as snorkeling, semi-submersible and glass bottom boat are all included. View this majestic wonderland from a helicopter before heading back down to sea level and cruising back to Cairns.